Egyptian policemen demonstrate at Cairo’s Tahrir Square, the epicenter of the popular revolt that drove veteran strongman Hosni Mubarak from power after 30 years on February 13, 2011. Welcome back to Sinica after our New Year’s break. 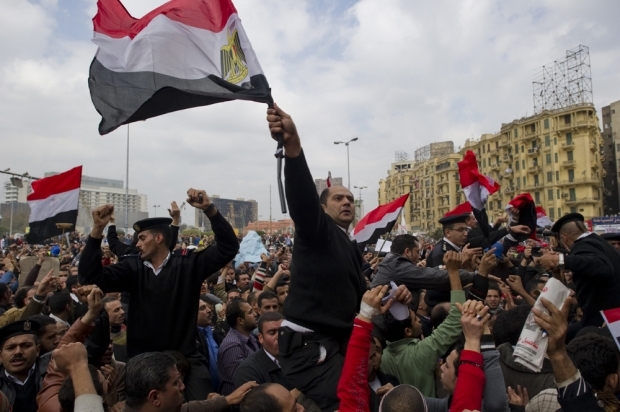 And what could headline our first podcast of the New Year but Egypt, where an unexpected political uprising has raised obvious parallels for China-watchers worldwide. Moving beyond the politics of protest, we also delve into the story of group-purchasing site Groupon, whose tongue-in-cheek Tibetan advertisement during the Super Bowl has tarnished the company’s image in China and damaged its largest strategic partnership in the country. Joining Kaiser Kuo in our studio today is Jeremy Goldkorn, the founder and lead editor of Danwei. Our other participants include Gady Epstein, a Sinica recidivist and the Beijing Bureau Chief of Forbes magazine, along with Will Moss who has also been on the show before and joins us to share his expertise on how not to “do a Groupon” in China.